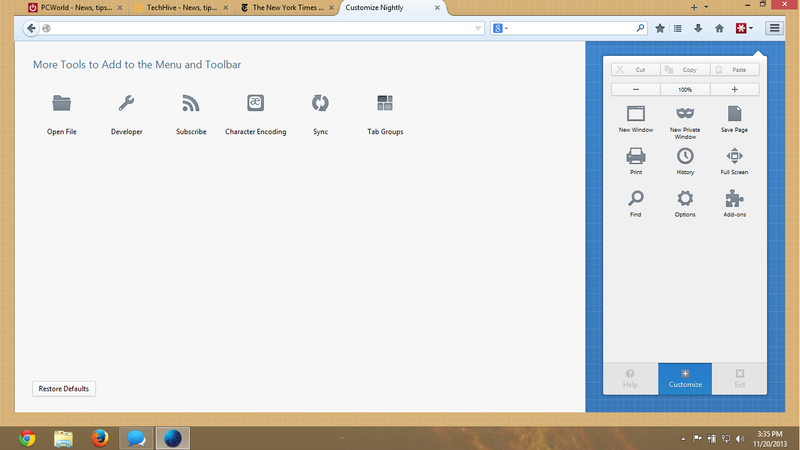 We got our first peek at Australis, Mozilla’s upcoming interface overhaul, in April 2012. Since then, pieces of Australis pieces have slowly worked their way into the latest versions of Firefox, like the new-look downloads arrow. Earlier this week, however, Mozilla finally brought the bulk of the new Australis aesthetic into the nightly preview builds of the popular open source browser. The revamp isn’t a drastic change, but it is still fairly significant for longtime Firefox users. Any Chrome users looking to switch browsers should also be right at home with Australis, since it borrows key design decisions from Google’s browser. The first thing you’ll notice with Australis is that the blocky Windows 7-style tabs are gone, replaced by a more rounded Chrome-style look. Mozilla is also making it easier to identify which tab is open by giving the current tab a prominent outline above the address bar, while background tabs won't have any outline at all. The orange Firefox menu bar, first introduced in 2010 with Firefox 4, is also gone from the upper left corner. 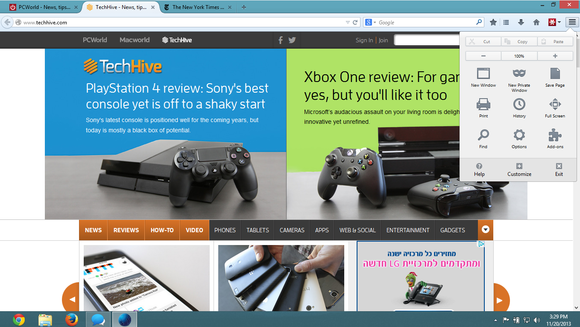 Instead, Mozilla replaced it with a menu button in the far right corner—again, similar to Chrome. If you prefer to have text menus running across the top of the screen, you can still do so by right-clicking on the Firefox toolbar and then selecting "Menu Bar." Firefox has always offered drag-and-drop customization for toolbars, and this longstanding feature has been expanded to embrace new drap-and-drop menu customization under Australis. By default, the menu includes some of the most common features, such as opening a new window, printing, and history. You can remove any of those items—or add less commonly used ones—by tapping the “Customize” button at the bottom of the drop down menu. Menu items that aren’t built into the menu by default include the developer tools, the ability to open a file, and Firefox Sync. Bookmarking will also be a little different with Australis. The star icon used to favorite Websites now sits in the browser chrome instead of the address bar. A bookmarks menu icon lies just next to the star for accessing and managing your saved sites. Those are the biggest changes so far with Australis. The add-ons manager looks the same and the new tab page showing your recent history also hasn't changed. Overall, the tweaks with Australis feels like an attempt to modernize the look of Firefox and do away with a lot of the Windows 7-era design decisions, like the orange menu bar. If you'd like to try out the Australis UI yourself, head on over to Mozilla's nightly builds page to download the browser for your system. Keep in mind, however, that Mozilla is still working on Australis and the UI we're seeing now could change before the official Firefox release.